The more sophisticated cousin of the gift basket. Some of our ideas on how to reuse your Goodie Tin. An additional benefit of a Goodie Tin is once you consume the goodies inside…flowers, coffee, nuts etc, the Goodie Tin itself can be recycled and used however you’d like. Here are some great ideas on how you can reuse. Baby Keepsake Holder – This one is a no-brainer. 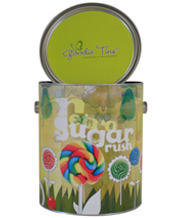 The tin is perfect to store some of the most precious memories from baby’s first. At a gallon, it is large enough to hold baby’s going home outfit, all his hospital bracelets, navel (once it drops off) and many other firsts. Baby Shower Memory Keeper – Another easy one. We like to use the Goodie Tin to hold the lovely notes and cards that you receive at a baby shower. Organize, Organize – Spring is the perfect time to purge and add some order to things. Goodie Tins are a handy way to keep little things organized. From Lego pieces to ribbons and bows. The list of what you can keep neat and in place is endless. Use as decor – Based on the color of your Goodie Tin, it can be used to accent a space like the bathroom pictured here. Love how the crisp blues and whites all came together in this bathroom. Any ideas on how you’ll use your empty Goodie Tin?